Originally the front and reverse sides of a single painted panel, these two images remained together until the middle of the nineteenth century. When they were seen by J. A. Crowe and G. B. Cavalcaselle in 1869 in the collection of Baron Triqueti of Paris, the two sides had already been separated; they are illustrated side by side in the sale catalogue of the collection of Mme Lee-Childe in 1886. 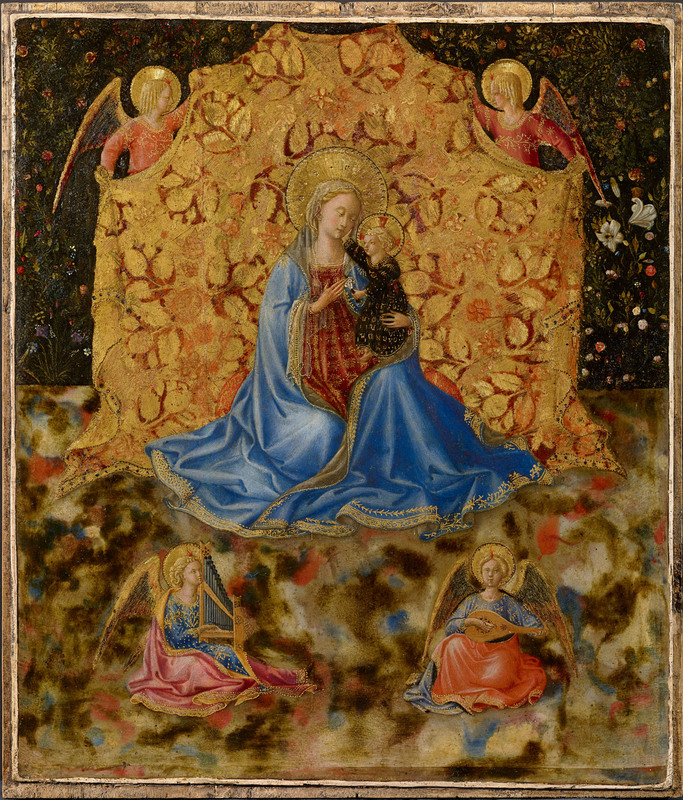 (*1) From that point on their histories diverged: the Virgin and Child remained largely accessible to scholars and the public, first in the collection of Edouard Aynard in Lyon,(*2) and then, from 1914, in the Museum of Fine Arts, Boston, while the Holy Face "disappeared," until its rediscovery only twenty years ago;(*3) the two paintings are reunited here for the first time, as far as is known, since 1886. 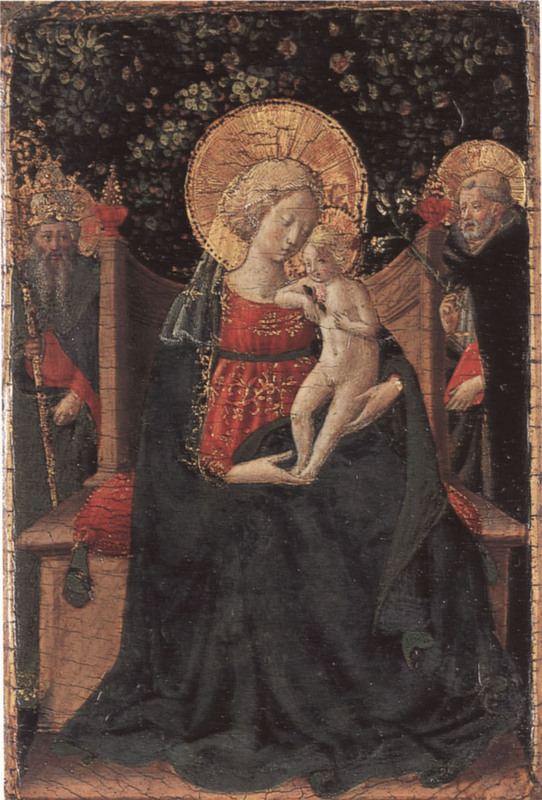 In explaining some of the peculiarities of the composition of the Boston Virgin and Child — specifically, the prominent isolation of the figure of a warrior saint, presumed to be Saint George, on the right side of the painting — Stefano Orlandi advanced a hypothesis associating this panel with the cession of the church of San Giorgio sulla Costa in Florence to the Observant Dominicans of Fiesole in January 1435 (see cat. 34). According to this theory, the kneeling donor at the left would be the parish priest, Tonnero de' Castellani, whose renunciation of his benefice allowed the Dominicans to take possession of San Giorgio pending resolution of their dispute with the Silvestrines at San Marco. (*4) Although accepted by a number of scholars,(*5) this proposal is unlikely for a number of reasons. First, the kneeling donor is shown wearing an ermine almuce, indicative of his rank as a canon — a dignity to which Tonnero de'Castellani is not known to have been elevated — and he is presented by Saints Peter and Paul, who are neither his name saints nor patrons of his other benefice, Sant'Andrea a Mosciano. (*6) Furthermore, the date of 1435 is entirely inappropriate for the style of the painting, which should, instead, be situated among the late works of Angelico's Roman period. 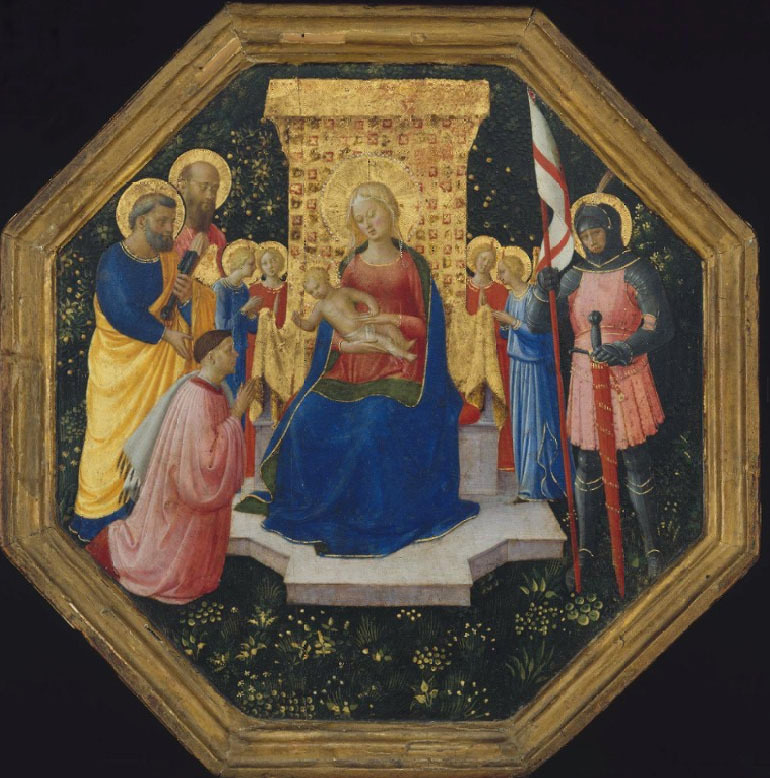 The octagonal form of the panel, its scale, and the fact that it was painted on both sides also argue for its manufacture somewhere other than in Florence, where this category of object had no precedent and generated no following. A Roman provenance for the Boston panel, appropriate to the presence of Saints Peter and Paul on the left, also is suggested by the subject of the reverse side. The Volto Christi, or face of Christ, was an image much venerated in Rome, especially in the form seen here, which follows the Greek type of the Mandylion. 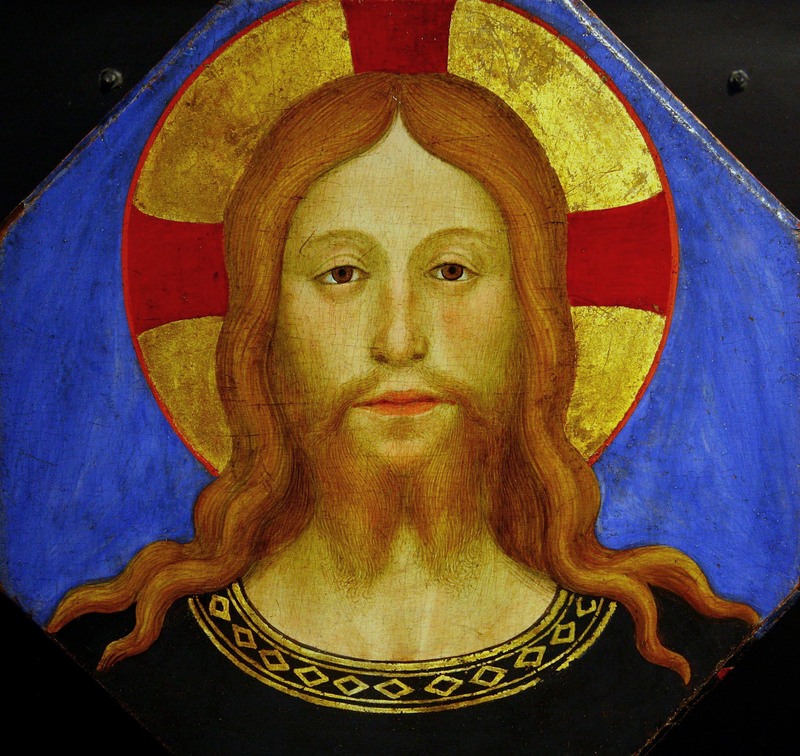 Supposed to be the "vera icon," or true image, of the face of Christ, it is distinguished from other representations of the Holy Face — such as a painting by Angelico now in Livorno and also included in this exhibition (cat. 33) — by the expression of passive, non-suffering dignity. The image of the Volto Christi as painted on the reverse of the Boston panel, framed by an octagonal surround, appears as a prominent feature of the silver cover of the principal icon in the Lateran basilica in Rome, the Acheropita — an image of Christ enthroned that is installed on the altar in the pope's private ora-tory, known as the Sancta Sanctorum. Throughout the Late Middle Ages, the pope celebrated Easter Mass at this altar, and it was here that a newly elected pope was vested and the keys to the Lateran and Vatican basilicas were delivered to him. (*7) Although he remains unidentified, it is not difficult to imagine that the donor portrayed in the Boston panel was a canon either of the Lateran basilica or of Saint Peter's, and that the commission of this painting may have been roughly coincidental with the election of Nicholas V as pope on March 6, 1447. 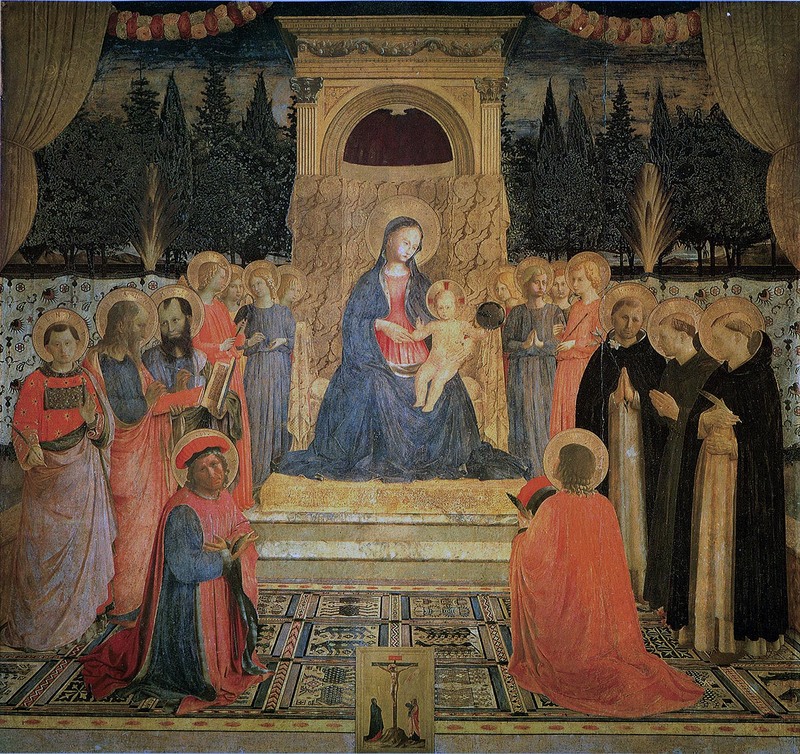 These paintings and the Boston panel are certainly by the same hand, but it is reasonable to assume that whereas the Bergamo and Courtauld pictures are conceived as imitations of works by Angelico, in the case of the Boston panel the young painter may have been working directly over a detailed drawing provided by Fra Angelico, given that the perspective of the Virgin's throne is more ambitious and more accurately resolved than in any independent painting by Gozzoli. 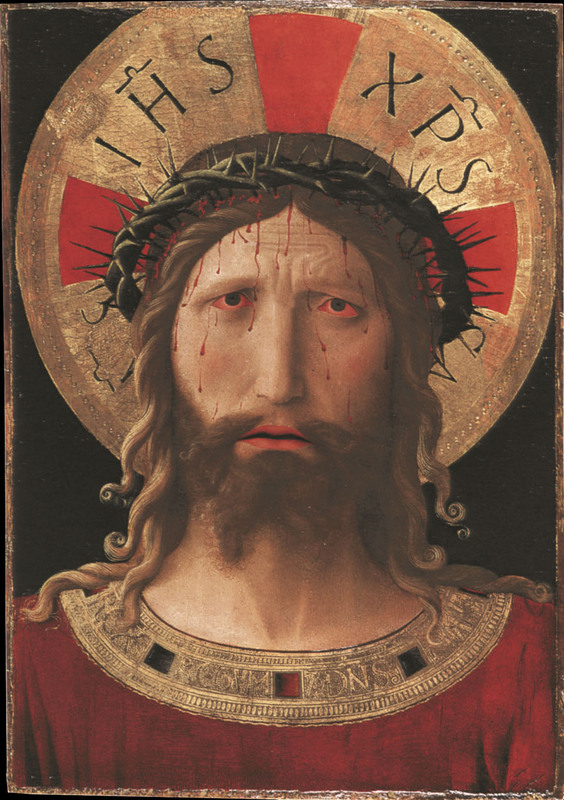 The image of the head of Christ, from the reverse of the Boston panel, also seems to reflect the participation of two artists — presumably, Angelico and Gozzoli, or possibly another of Angelico's assistants named in documents of 1447(*10) — one serving as designer and one as executant. Such details as the flatly embroidered collar of Christ's tunic or the symmetrical waves of hair falling on his shoulders lack the sophistication to be expected from an autograph work by Angelico at this date. However, close scrutiny of Christ's eyes reveals that the left one is expertly rendered as a carefully inflected orb while the right eye is an uninspired copy of the first. Again, it is not unreasonable to assume that Angelico provided a drawing for this figure and may have contributed some details of its final form, but it is otherwise correct to classify the painting as a workshop product. (*1). Crowe and Cavalcaselle 1869-76, vol. 11, p. 164 n. 78; sold, Hotel Drouot, Paris, May 4, 1886, lot 1. (*2). Sold, Galerie Georges Petit, Paris, December 4, 1913, lot 35. (*3). Boskovits 1983, pp. 12-13; Corsini 1984, pp. 16-19. (*4). Orlandi 1964, pp. 63-64. (*5). Baldini 1970, p. 95; Pope-Hennessy 1974, p. 222; Boskovits 1983. (*7).S. Romano 2000, pp. 39-41. (*8). Van Marie 1928, pp. 156, 164; Muratoff 1930, p. 59; Pope-Hennessy 1952, p. 197; Pope-Hennessy 1974, p. 222. (*9). Boskovits 2002 b, pp. 48-50. (*10). The documents cite Pietro Jachomo da Furli [Forli], Giovanni d'Antonio de la Checa, Carlo di ser Lazzaro da Narni, Jachomo d'Antonio da Poli (see Orlandi 1964, pp. 188-89).